G�bor Pa�l is a German publisher and journalist at Südwestrundfunk (Southwest Broadcasting), where he presents and produces radio discussions and documentaries. He also co-publishes the annual "Radio Akademie" for the culture and science program SWR2. He studied Geography and Earth Sciences in Frankfurt und Edinburgh. His focus in as a journalist is on the dynamics of Global Change and the Information and Knowledge Society. In his first book Was ist schön? Ästhetik und Erkenntnis he designed an new concept of aesthetics as well as an aesthetic theory of learning. He is also interested in the history of science and in the interface between science and culture. 2008 he published his first lyric book, Lyrik ist Logik – Gedichte aus der Wissenschaft, an attempt to reveal the poetic side of science. 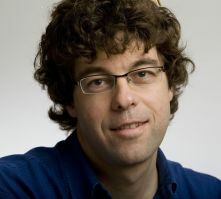 Paál has been the recipient of several media prizes, including the Heureka award for science journalism, the German Media Award of development politics, and the Media Award of German Geography.